Vue is a progressive framework for building user interfaces. And it is basically focused in the view layer only. It has a very low learning curve, it is easy to integrate with other frameworks and libraries and it is very easy to adopt in any project. In this small tutorial, we’ll create a small todo list app, with the possibilities of creating, finishing and deleting tasks. To achieve this, we are going to use some of the most important Vue directives and we will also cover how to add interactivity through events. The names of the parameters are very descriptive. The el parameter is to set the instance’s root reference, in this case, it will be the table with the list id. The data parameter is an object containing all the data that it is needed by the instance. And finally, the methods parameter will hold all the methods that will be executed by the instance. Now, let’s see how can be used this array to render a table row for each object contained in it. To do this, let’s use the v-for directive. This directive is used to create a loop and display an element multiple times. Now, it is possible to add interactivity to the App. To achieve this, we will use the v-on directive. This directive is useful to hear DOM events. In this case we will use its shorthand method. When the Add button is clicked, a new object is added into the array. Do notice how the name property that is used by the input as a model is used as the name property of the object. Once the object is pushed into the array, an empty string is assigned again to the name property. Test the result and you’ll see that it is possible to write a task name and add it to the list clickin on the Add button. Test the result and you’ll see that it is possible to finish a task clicking on the Finish button. Once you click on it, the button will disappear showing in its place the Delete button and the name of the task will get cross out. The del method receives the index of the row in which the button has been clicked, and a splice is applied to the array deleting the element in that index. 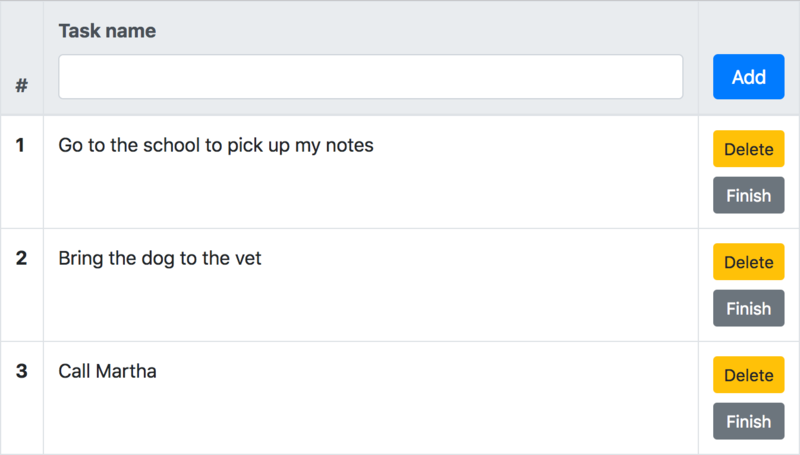 Test the final result and you’ll see that now it is possible to add, finish and delete tasks. That’s it all, the todo list app is ready. As you can see, starting to work with Vue is not hard. It is very intuitive and very easy to adopt in a short period. If you want to learn more, you can check the Vue documentation that is pretty well to start. I hope that this short tutorial has helped you to get started with Vue.js. Download the example files of the tutorial of initiation of Vue. It is possible to insert code fragments between <pre></pre> tags and HTML or XML code between <xmp></xmp> tags.